The New York Giants visit the Washington Redskins in Week 12 of the 2017 NFL season. PFF previews the top player matchups of the game. 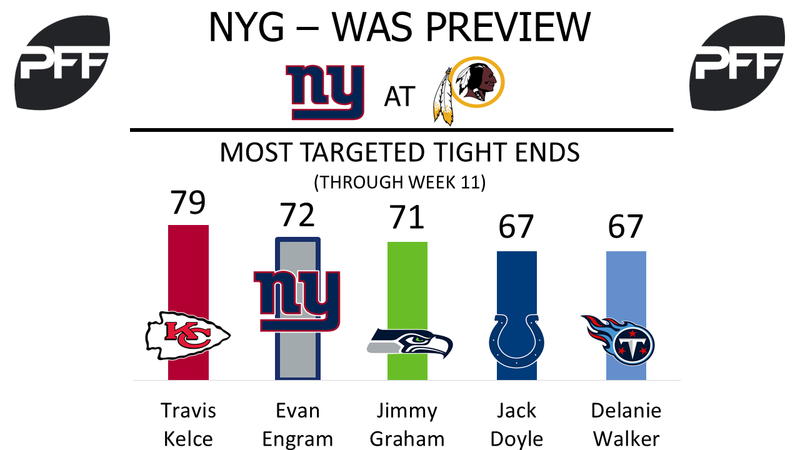 TE Evan Engram vs. LBs Martrell Spaight and Zach Brown – The second-most targeted tight end in the league, Evan Engram has the potential to draw some mismatches this week. The rookie has been one of the most utilized tight ends in the league, with his 335 snaps in route the second most among all tight ends. Unfortunately, Engram has struggled with drops, dropping seven of his 48 catchable targets, the most among all tight ends. His drop rate of 14.58 is currently the third-worst rate among 36 qualifying tight ends. However, Engram should see matchups against both Martrell Spaight and Zach Brown on Thursday, two linebackers that have struggled in coverage. Brown’s coverage grade of 33.7 currently ranks 75th among 77 qualifying linebackers. Spaight isn’t fairing much better, as his coverage grade of 37.7 currently sits at 69th. With Washington’s strong secondary looming, and some favorable matchups for Engram, don’t be surprised if the rookie has one of his better outings. T Ereck Flowers vs. Edge Junior Galette – Ereck Flowers has vastly improved his pass blocking the past two weeks, and is currently on pace to allow 37 pressures this season, an improvement over his past two years in the league. After allowing 23 pressures (four sacks) in Weeks 1 through 9, Flowers has yet to allow a single pressure in the past two weeks (77 total pass-block snaps). His pass-block grade of 75.4 currently ranks 28th among 80 qualifying offensive tackles. Junior Galette has made the most of his limited pass-rush opportunities; his pass-rush productivity (measures pressure created on a per snap basis with weighting toward sacks) of 11.8 is currently tied for the 15th-best rate among 108 qualifying edge defenders. His pass-rush grade of 79.3 currently sits at 32nd among 106 qualifying edge defenders. Giants wide receivers vs. Washington secondary – One team’s weakness versus another team’s strength. If Sterling Shepard doesn’t suit up Thursday, the highest-graded wide receiver for the Giants will be Roger Lewis, who ranks 70th among 115 qualifying wide receivers with an overall grade of 63.0. Combine that with the likes of Kendall Fuller (ranks 12th among 118 qualifying cornerbacks, 87.0 overall grade), Quinton Dunbar (26th, 81.6 overall grade), and Josh Norman (31st, 80.6 overall grade), and it could be a long day for this receiving group. C Tony Bergstrom vs. DI Damon Harrison – With starting center Spencer Long on IR and backup Chase Roullier sidelined with a hand injury, the Redskins will turn to their third option to man the middle of the offensive line; sixth-year lineman Tony Bergstrom. Bergstrom signed with the team prior to Week 8, and has played 44 snaps, albeit at guard, so far this year, with 41 of those coming in the run game, where he’s managed a run-blocking grade of just 28.6. In his first start, he’ll be looking to improve upon his shaky start, but that’s no easy task against Damon Harrison, who has been near unblockable against the run this season. Through 11 Weeks, Harrison’s run-stop percentage of 12.1 percent ranks fourth among interior linemen, while his elite run-defense grade of 94.3 ranks first. 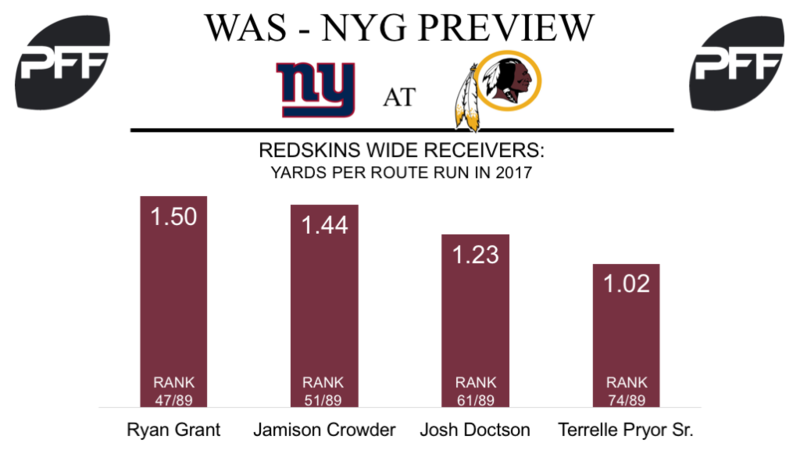 TE Vernon Davis vs. S Landon Collins – With Jordan Reed recovering from injury, the veteran tight has continually come up with big catches to help his team. Through 11 weeks, Davis has amassed 527 receiving yards at an 2.43 yards per route run, which is tops among tight ends with at least 20 targets. Additionally, 149 of his receiving yards have come on ‘deep’ passes that traveled at least 20 yards downfield, the fourth highest mark by a tight end. With pass-catching back Chris Thompson now out for the season, Davis could see a few extra targets sent his way this week, and he’ll likely be battling safety Landon Collins, who has allowed 0.94 yards per coverage snap this season, which ranks 77th among 86 safeties. WR Ryan Grant vs. CB Ross Cockrell – Up to this point of the year, Grant has lived up to his off-season hype, and has arguably been one of the best receivers on the roster, catching 30-of-33 catchable targets for 338 receiving yards and three scores, and through 11 weeks both Grant’s average of 1.50 yards per route run and his wide receiver rating of 127.9 are tops among the Redskins’ receivers. On Thursday, he’ll be looking to pull further away from his teammates as he goes up against Ross Cockrell, who has allowed a passer rating of 102.6 on throws into his coverage this year, which ranks 81st of 118 qualifying cornerbacks.